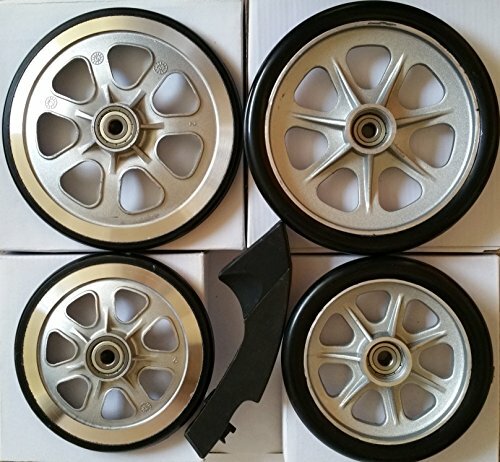 Each quantity is for purchasing on a set of complete parts, which includes 4 Wheels (2 large and 2 small) and brake arm and pad for LandRoller Terra 9 skates. The strength on these parts is between the regular that came with the LandRoller skates and the heavy duty qualities (very solid). Each wheel is individually wrapped and sealed and boxed. They are high quality and may have minor scratches from original shipping from the manufacturer. Please inspect your skates and parts (wheels and brake) before each use. By purchasing these parts, you assume full responsibility for any accidents/injuries that may arise. Get them before the entire world is out of stock of those parts! If you have any questions about this product by LandRoller, contact us by completing and submitting the form below. If you are looking for a specif part number, please include it with your message.